The Cochrane review did not look at the effect of community water fluoridation (CWF) on dental fluorosis. It simply reviewed data on the prevalence of dental fluorosis at different fluoride drinking water concentrations – up to 7.6 ppm which is well outside the optimum concentration used for CWF. This is strange for a review specifically about CWF. Strictly speaking, as it stands this section should have been a separate review on dental fluorosis itself. However, this review did calculate a probable dental fluorosis prevalence at 0.7 ppm (the usual concentration used in CWF) which is misleading because it can be misinterpreted as due completely to CWF when it isn’t. And, of course, anti-fluoridation propagandists have cherry-picked and misinterpreted this. I think is was a serious mistake for the reviewers to include this section in a review on CWF as this can imply the calculated prevalences quoted are caused by CWF. They aren’t. Quite wrong – the association was with fluoride concentration (and most studies were of natural fluoride levels) – not with CWF. Their use of the term “water fluoridation” to cover natural fluoride concentrations up to 14 ppm is irresponsible and misleading. It simply attempted to find a quantitative relationship between “fluoride level” (concentrations of naturally derived fluoride in drinking water) and dental fluorosis prevalence. It did this for all grades of dental fluorosis from “questionable” to “severe” (see figure above for illustrations fo the different grades). It also did this for “dental fluorosis of aesthetic concern” (which they arbitrarily defined as the mild, moderate and severe forms – they acknowledge inclusion of “mild” forms here is debatable). The figure below gives an idea of the data they were working with. 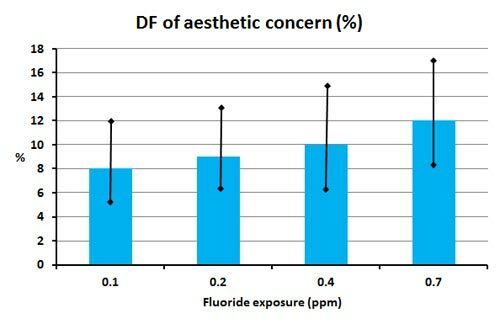 Using this data they produced tables of the probability of any forms of dental fluorosis, and of dental fluorosis of aesthetic concern at fluoride concentrations from 0.1 to 4 ppm. In the figures below I have converted their probability values to a calculated prevalence of dental fluorosis at concentrations up to 0.7 ppm. Why should the review have considered differences between fluoridated and unfluoridated areas for its conclusions about tooth decay – but ignore the differences between fluoridated and unfluoridated areas in its consideration of dental fluorosis? In Misrepresentation of the new Cochrane fluoridation review I estimated what the possible effects of CWF is from the calculated probabilities in the Cochrane review. I am surprised the reviewers do not do this themselves as their review was meant to be about CWF and not natural fluoride levels in general. At 0.7 ppm (the usual concentration for CWF), the calculated prevalence of all forms of dental fluorosis is 40%. But to calculate the prevalence due to CWF we must subtract the prevalence for non-fluoridated water. So dental fluorosis due to CWF would be 40% – 33% = 7 % of people (using the review’s concentration for non-fluoridated water of 0.4 ppm) or 40% – 30% = 10 % of people (using a more realistic concentration of 0.2 ppm). 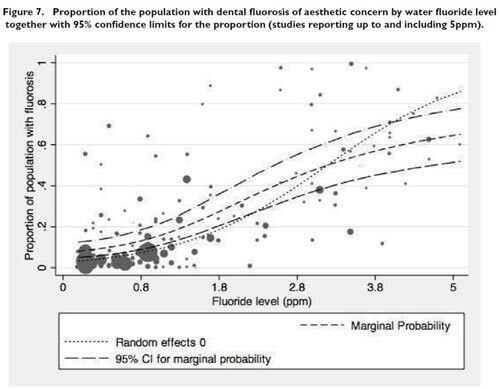 Similarly, if we consider only those forms of dental fluorosis the review considers of “aesthetic concern,” then calculated prevalence due to CWF amounts to only 12% – 10% = 2% of people (using the reviews definition of non-fluoridated) or 12% – 9% = 3% of people using a more realistic concentration of 0.2 ppm for non-fluoridated. It is not surprising (considering the data in the figures above) that surveys usually find no changes in the severe and medium forms of dental fluorosis (usually considered of “aesthetic concern”) due to CWF. I think the Cochrane reviewers were irresponsible to quote calculations which did not include the difference between fluoridated and non-fluoridated areas. This has enabled anti-fluoridation propagandists to use the authority of the Cochrane name to imply, as they often do, that CWF causes a dental fluorosis prevalence of 40%! The review section on dental fluorosis should not be read as information on the effects of CWF – although the presented data can be used to calculate possible effects. These calculations confirm findings of published surveys that CWF has no effect of the forms of dental fluorosis of aesthetic concern. Sensible readers will not rely on such misrepresentation or brief media reports. Nor will they rely on the Abstract or Plain Language Summary – which have problems. They will read the whole document – critically and intelligently. This is the only way to find out what the true content of this review is. This entry was posted in Health and Medicine, SciBlogs, science, Science and Society and tagged Cochrane Fluoridation review, Dental fluorosis, fluoridation, fluoride, fluorosis, SciBlogs. Bookmark the permalink.